Fall River Mayor Jasiel Correia II at a morning press-conference. 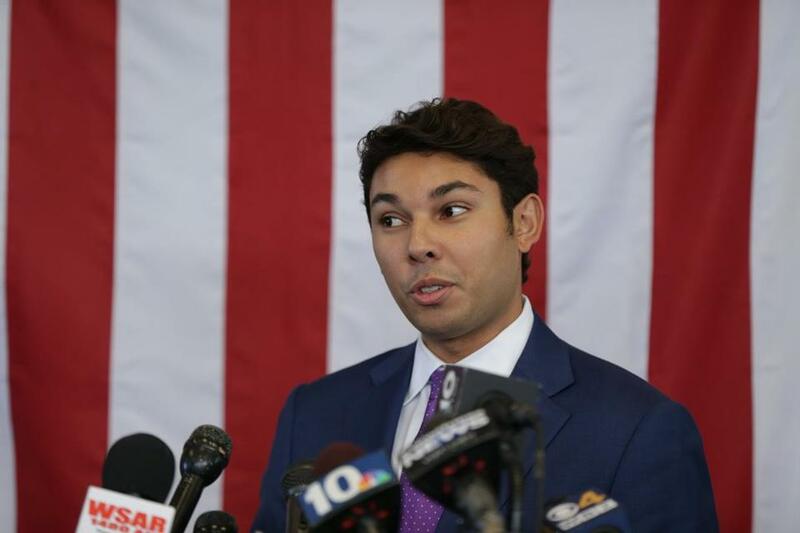 Fall River Mayor Jasiel F. Correia II this week survived a City Council vote that would have ousted him from office temporarily, but his legal woes continue to unfold. The state Office of Campaign and Political Finance has informed Correia’s lawyer that he can’t tap his legal defense fund to pay bills related to his federal criminal case because the allegations aren’t related to his public duties. The e-mail, which was addressed to Mark Berthiaume, a lawyer for Correia, was first reported Tuesday by WSAR-AM, a radio station in Fall River. Correia, 26, has $76,650 in the legal defense fund, including $18,500 from his political campaign war chest. Cronin said Correia may use the account for legal bills incurred before the indictment was finalized because he had “good faith” to believe the investigation may have been related to his conduct as mayor. The FBI arrested him Oct. 11 on charges that he defrauded investors in his tech startup SnoOwl and then filed false tax returns to conceal the scheme. Prosecutors allege Correia, a Democrat elected in 2015, spent more than $231,000 in stolen funds on expensive travel, casinos, adult entertainment, and a luxury car. Correia has pleaded not guilty and refuses to relinquish power. He is in the first year of his second, two-year term. Correia and his lawyers didn’t respond Wednesday to requests for comment. On Tuesday, the City Council overwhelmingly approved a no-confidence vote in Correia and requested his resignation. A third measure that would have removed Correia from office while his federal criminal case is pending failed by a 5-4 margin. A group known as Fall River Recall is collecting signatures to force a recall election for Correia, said Joseph Pereira, a spokesman for the organization. He said recall organizers have heard from voters who are angry with Correia and frustrated that the City Council defeated a measure that would have required him to step aside temporarily. Under the city charter, Fall River Recall must collect the signatures of 2,510 voters, which is 5 percent of the city’s 50,207 registered voters, and submit them by Nov. 16, said City Clerk Alison M. Bouchard. Six of the city’s nine councilors have signed the recall petition, Pereira said. If the necessary signatures are certified, Correia would have five days to resign before the Council could schedule a recall election. That would be held at least 65 days from when the signatures were certified, according to the charter. Pereira said volunteers have been collecting signatures at shopping plazas and other spots in the city. The group hopes to collect about 3,000 signatures, he said. Fall River voters recalled former Mayor William Flanagan from office four years ago. Correia, then a city councilor, backed the effort by signing the recall petition. Flanagan denied the accusation, and no charges were filed. A special prosecutor found Correia credible, but the evidence insufficient to support a criminal charge. But Flanagan was recalled, and Bristol District Attorney Sam Sutter was elected in a special election. A year later, in 2015, when Sutter’s term was up, Correia ran against him and won.